He is risen, Alleluia Alleluia! The bulletin for the week of May 02, 2010 has been posted. Click here to see it. The missionaries Paul and Barnabas complete their journey. "I will praise your name for ever, my king and my God." Like bride and groom, God pledges everlasting love. Jesus' followers live by a new commandment: love one another. Jesus commands us to love one another. Today we open our hearts to receive Christ’s new commandment: that we love one another as He has loved us. Throughout this Easter season, we ponder that love, which gained for us the promise of eternal life. As we are drawn into the vision of Saint John in the book of Revelation, let us pray for a strengthening of our love for one another. How do you make obvious that you love your family and friends? The world is full of examples of people who do not love others. What are the results of hate that you see in the world? How would the world be different if we followed Jesus’ commandment? Jesus’ commandment to love another is a challenge. What will you do this week to deepen the love you have for those around you in life? "I give you a new commandment: love one another. As I have loved you, so you should also love one another." Jesus reminds us of the command God gave to the Israelites through Moses to Love your neighbor as yourself. Next, Jesus tells us to Love your enemies. Do good to those who hate you. Psychologists only recently discovered that we must love ourselves in order to be able to love others. That is how God created us. Sadly, many of us do not love ourselves enough to feel that we can be loved by others, or by God. And, sadly, there is a risk that the only one that we will ever love will be ourselves. Jesus takes love to a whole new dimension. Love one another as I have loved you – unconditionally: without a pre-condition of recognition, without expectation of being loved in return. God made us stewards of His love – for ourselves and for others. Are we ready to give an account of our stewardship – to answer the question, "What have you done with My love?" It looks like our article in the Opelousas Daily World is getting picked up by other papers. The Immaculate Conception Bell at St. Landry Catholic Church is featured in a front page article at the Opelousas Daily World! As far as we know, we've got the only bell in the world that posts to Facebook, Twitter, and its own blog! The article, written by William Johnson, definitely does a great job of telling the bell's story. There is a questionaire to help decide if you're being called, information on this year's ordination class, videos of ordinations, and videos of young people who have answered a call to the religious life. Please share the link with any young people you know who may be interested in a religious vocation. 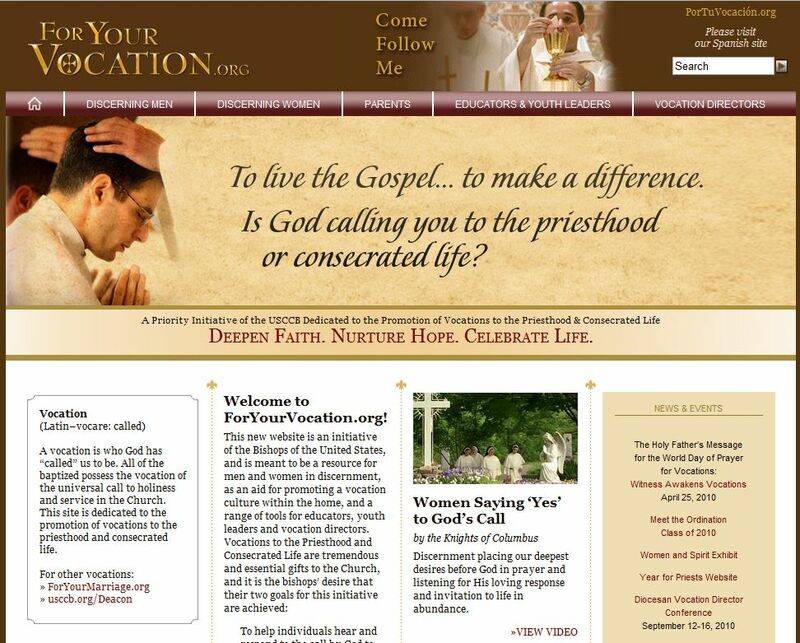 WASHINGTON—The U.S. Bishops’ Secretariat of Clergy, Consecrated Life and Vocations is initiating a new website on April 25 to be a resource for both laity and clergy in the promotion of vocations. The launch date is the World Day of Prayer for Vocations and Good Shepherd Sunday. To educate all Catholics on the importance of encouraging others through prayer and activities to promote vocations. Last Saturday, Pope Benedict XVI spoke at a national conference in Italy on "Digital Witnesses: Faces and Languages in the Cross-Media Age". The Italian bishops' conference is the group that promoted this conference. One witnesses, then, a "polluting of the spirit, which makes us smile less, makes our faces gloomier, less likely to greet each other or look each other in the eye..." ("Speech in the Piazza di Spagna, December 8, 2009"). But this meeting points to recognizing faces and so to overcoming those collective dynamics that can make us lose the perception of the depth of persons and remain at the surface: When that happens, they are bodies without souls, objects of trade and consumption. The media can become a factor in humanization "not only when, thanks to technological development, they increase the possibilities of communicating information, but above all when they are geared towards a vision of the person and the common good that reflects truly universal values" (no. 73). This demands that they "focus on promoting the dignity of persons and peoples, they need to be clearly inspired by charity and placed at the service of truth, of the good, and of natural and supernatural fraternity" (ibid.). Zenit has just posted an English translation of his talk. Vatican Information Services announced this morning that the new statistical yearbook of the Church has been released. It contains detailed information on the number of Catholics around the world as well as the number of priests, bishops, and other religious. VATICAN CITY, 27 APR 2010 (VIS) - The Vatican Publishing House has recently released a new edition of the Statistical Yearbook of the Church, comprising information on the main aspects of Catholic Church activity in various countries for the period 2000-2008. Over these nine years, the Catholic presence in the world has grown from 1,045 million in 2000 to 1,166 million in 2008, an increase of 11.54 percent. Considering the statistics in detail, numbers in Africa grew by 33 percent, in Europe they remained generally stable (an increase of 1.17 percent), while in Asia they increased by 15.61 percent, in Oceania by 11.39 percent and in America by 10.93 percent. As a percentage of the total population, European Catholics represented 26.8 percent in 2000 and 24.31 percent in 2008. In America and Oceania they have remained stable, and increased slightly in Asia. The number of bishops in the world went up from 4541 in 2000 to 5002 in 2008, an increase of 10.15 percent. The number of priests also increased slightly over this nine-year period, passing from 405,178 in 2000 to 409,166 in 2008, an overall rise of 0.98 percent. In Africa and Asia their numbers increased (respectively, by 33.1 percent and 23.8 percent), in the Americas they remained stable, while they fell by 7 percent in Europe and 4 percent in Oceania. The number of diocesan priests increased by 3.1 percent, going from 265,781 in 2000 to 274,007 in 2008. By contrast, the number of regular priests showed a constant decline, down by 3.04 percent to 135,159 in 2008. Of the continents, only Europe showed a clear reduction in priests: in 2000 they represented 51 percent of the world total, in 2008 just 47 percent. On the other hand, Asia and Africa together represented 17.5 percent of the world total in 2000 and 21.9 percent in 2008. The Americas slightly increased its percentage to around 30 percent of the total. Non-ordained religious numbered 55.057 in the year 2000 and 54,641 in 2008. Comparing this data by continent, Europe showed a strong decline (down by 16.57 percent), as did Oceania (22.06 percent), the Americas remained stable, while Asia and Africa grew (respectively, by 32 percent and 10.47 percent). Female religious are almost double the number of priests, and 14 times that of non-ordained male religious, but their numbers are falling, from 800,000 in 2000 to 740,000 in 2008. As for their geographical distribution, 41 percent reside in Europe, 27.47 percent in America, 21.77 percent in Asia and 1.28 percent in Oceania. The number of female religious has increased in the most dynamic continents: Africa (up by 21 percent) and Asia (up by 16 percent). The Statistical Yearbook of the Church also includes information on the number of students of philosophy and theology in diocesan and religious seminaries. In global terms, their numbers increased from 110.583 in 2000 to more than 117.024 in 2008. In Africa and Asia their numbers went up, whereas Europe saw a reduction. 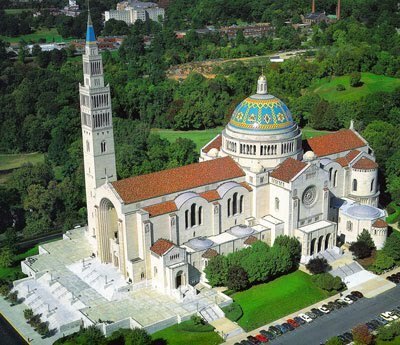 Yesterday, a mass celebrating the fifth anniversary of Pope Benedict XVI's election as Pope was celebrated at the Basilica of National Shrine of the Immaculate Conception in Washington, D.C. Due to some complications, Bishop Edward Slattery of Tulsa, Oklahoma was asked to be the celebrant at the last minute. The homily he gave at the mass was truly thoughtful and beautiful and I thought I would share it with all of you. … much to speak of on this glorious occasion when we gather together in the glare of the world’s scrutiny to celebrate the fifth anniversary of the ascension of Joseph Ratzinger to the throne of Peter. We must come to understand how it is that suffering can reveal the mercy of God and make manifest among us the consoling presence of Jesus Christ, crucified and now risen from the dead. We must speak of this mystery today, first of all because it is one of the great mysteries of revelation, spoken of in the New Testament and attested to by every saint in the Church’s long history, by the martyrs with their blood, by the confessors with their constancy, by the virgins with their purity and by the lay faithful of Christ’s body by their resolute courage under fire. But we must also speak clearly of this mystery because of the enormous suffering which is all around us and which does so much to determine the culture of our modern age. From the enormous suffering of His Holiness these past months to the suffering of the Church’s most recent martyrs in India and Africa, welling up from the suffering of the poor and the dispossessed and the undocumented, and gathering tears from the victims of abuse and neglect, from women who have been deceived into believing that abortion was a simple medical procedure and thus have lost part of their soul to the greed of the abortionist, and now flowing with the heartache of those who suffer from cancer, diabetes, AIDS, or the emotional diseases of our age, it is the sufferings of our people that defines the culture of our modern secular age. This enormous suffering which can take on so many varied physical, mental, and emotional forms will reduce us to fear and trembling - if we do not remember that Christ - our Pasch - has been raised from the dead. Our pain and anguish could dehumanize us, for it has the power to close us in upon ourselves such that we would live always in chaos and confusion - if we do not remember that Christ - our hope - has been raised for our sakes. Jesus is our Pasch, our hope and our light. He makes himself most present in the suffering of his people and this is the mystery of which we must speak today, for when we speak of His saving presence and proclaim His infinite love in the midst of our suffering, when we seek His light and refuse to surrender to the darkness, we receive that light which is the life of men; that light which, as Saint John reminds us in the prologue to his Gospel, can never be overcome by the darkness, no matter how thick, no matter how choking. Our suffering is thus transformed by His presence. It no longer has the power to alienate or isolate us. Neither can it dehumanize us nor destroy us. Suffering, however long and terrible it may be, has only the power to reveal Christ among us, and He is the mercy and the forgiveness of God. The mystery then, of which we speak, is the light that shines in the darkness, Christ Our Lord, Who reveals Himself most wondrously to those who suffer so that suffering and death can do nothing more than bring us to the mercy of the Father. But the point which we must clarify is that Christ reveals Himself to those who suffer in Christ, to those who humbly accept their pain as a personal sharing in His Passion and who are thus obedient to Christ’s command that we take up our cross and follow Him. Suffering by itself is simply the promise that death will claim these mortal bodies of ours, but suffering in Christ is the promise that we will be raised with Christ, when our mortality will be remade in his immortality and all that in our lives which is broken because it is perishable and finite will be made imperishable and incorrupt. This is the meaning of Peter’s claim that he is a witness to the sufferings of Christ and thus one who has a share in the glory yet to be revealed. Once Peter grasped the overwhelming truth of this mystery, his life was changed. The world held nothing for Peter. For him, there was only Christ. Only later - much later - would Peter come to understand the full implication of this first Profession of Faith. Peter would still have to learn that to follow Christ, to truly be His disciple, one must let go of everything which the world considers valuable and necessary, and become powerless. This is the mystery which confounds independent Peter. It is the mystery which still confounds us: to follow Christ, one must surrender everything and become obedient with the obedience of Christ, for no one gains access to the Kingdom of the Father, unless he enter through the humility and the obedience of Jesus. Peter had no idea that eventually he would find himself fully accepting this obedience, joyfully accepting his share in the Passion and Death of Christ. But Peter loved Our Lord and love was the way by which Peter learned how to obey. “Lord, you know that I love thee,” Peter affirms three times with tears; and three times Christ commands him to tend to the flock that gathers at the foot of Calvary - and that is where we are now. Peter knew that Jesus was the true Shepherd, the one Master and the only teacher; the rest of us are learners and the lesson we must learn is obedience, obedience unto death. Nothing less than this, for only when we are willing to be obedient with the very obedience of Christ will we come to recognize Christ’s presence among us. Obedience is thus the heart of the life of the disciple and the key to suffering in Christ and with Christ. This obedience, is must be said, is quite different from obedience the way it is spoken of and dismissed in the world. For those in the world, obedience is a burden and an imposition. It is the way by which the powerful force the powerless to do obeisance. Simply juridical and always external, obedience is the bending that breaks, but a breaking which is still less painful than the punishment meted out for disobedience. Thus for those in the world obedience is a punishment which must be avoided; but for Christians, obedience is always personal, because it is centered on Christ. It is a surrender to Jesus Whom we love. For those whose lives are centered in Christ, obedience is that movement which the heart makes when it leaps in joy having once discovered the truth. Let us consider, then, that Christ has given us both the image of his obedience and the action by which we are made obedient. The image of Christ’s obedience is His Sacred Heart. That Heart, exposed and wounded must give us pause, for man’s heart it generally hidden and secret. In the silence of his own heart, each of us discovers the truth of who we are, the truth of why we are silent when we should speak, or bothersome and quarrelsome when we should be silent. In our hidden recesses of the heart, we come to know the impulses behind our deeds and the reasons why we act so often as cowards and fools. Christ’s Sacred Heart is the image of the obedience which Christ showed by his sacrificial love on Calvary. The Sacrifice of Calvary is also for us the means by which we are made obedient and this is a point which you must never forget: at Mass, we offer ourselves to the Father in union with Christ, who offers Himself in perfect obedience to the Father. We make this offering in obedience to Christ who commanded us to “Do this in memory of me” and our obediential offering is perfected in the love with which the Father receives the gift of His Son. Do not be surprised then that here at Mass, our bloodless offering of the bloody sacrifice of Calvary is a triple act of obedience. First, Christ is obedient to the Father, and offers Himself as a sacrifice of reconciliation. Secondly, we are obedient to Christ and offer ourselves to the Father with Jesus the Son; and thirdly, in sharing Christ’s obedience to the Father, we are made obedient to a new order of reality, in which love is supreme and life reigns eternal, in which suffering and death have been defeated by becoming for us the means by which Christ’s final victory, his future coming, is made manifest and real today. Suffering then, yours, mine, the Pontiffs, is at the heart of personal holiness, because it is our sharing in the obedience of Jesus which reveals his glory. It is the means by which we are made witnesses of his suffering and sharers in the glory to come. Do not be dismayed that there many in the Church have not yet grasped this point, and fewer still in the world will even consider it. You know this to be true and ten men who whisper the truth speak louder than a hundred million who lie. If then someone asks of what we spoke today, tell them we spoke of the truth. If someone asks why it is you came to this Mass, say that it was so that you could be obedient with Christ. If someone asks about the homily, tell them it was about a mystery and if someone asks what I said of the present situation, tell them only that we must - all of us - become saints. During the homily, Monsignor Romero referenced question 78 of the Compendium in the section "The Fall". 78. After the first sin, what did God do? After the first sin the world was inundated with sin but God did not abandon man to the power of death. Rather, he foretold in a mysterious way in the “Protoevangelium” (Genesis 3:15) that evil would be conquered and that man would be lifted up from his fall. This was the first proclamation of the Messiah and Redeemer. Therefore, the fall would be called in the future a “happy fault” because it “gained for us so great a Redeemer” (Liturgy of the Easter Vigil). The current week's homily is available on a link on the front page of the website next to the link for the current week's bulletin. On the page with the prior bulletins, the corresponding homily will be sitting side by side with its bulletin. We started on the anniversary of the start of the Catholic Church, Pentecost Sunday. This week, the Fourth Sunday of Easter, is our sixty third podcast to be posted. This week, the homily is given by Monsignor J. Robert Romero. So, take a listen and let us know what you think. 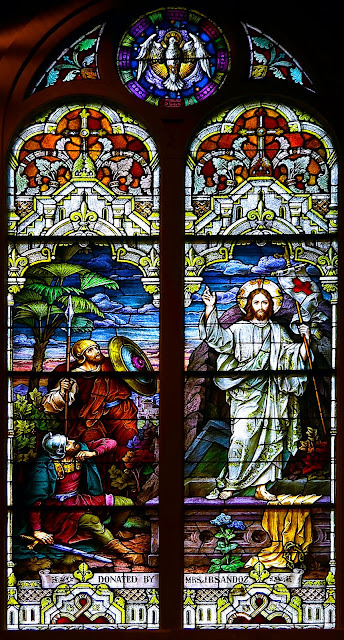 Click here to download the Fourth Sunday of Easter homily from St. Landry Catholic Church, Opelousas, Louisiana. Paul and Barnabas preach to the Gentiles. "We are his people, the sheep of his flock." The Lamb of God is our shepherd who leads us to life-giving pastures. No one can harm one of Jesus' lambs. Jesus knows us and calls us. Each year of this Fourth Sunday of Easter, we focus on the image of Jesus the Good Shepherd. As members of His holy flock, we open our ears to listen to his voice in the sacred word proclaimed this day. Jesus promises to guard us like a shepherd does the sheep. How do you experience his loving care in your life? Jesus said, "My sheep hear my voice: I know them, and they follow me." What new path is he asking you? What is your experience of being a follower of Christ, of being cared for and guarded with him as shepherd? Let your inner “sunshine” glow for others to see. Your hopefulness, peace, contentment, and comfort in relationship with God, and in stewardship expressions, shine as testimonies to the life you choose to live as one of Christ’s disciples. Attitude, word, and deeds are visible “rays” of stewardship. The bulletin for the week of April 25, 2010 has been posted. Click here to see it. Country Roads Magazine called. Check out their website: http://www.countryroadsmagazine.com/ They might write an article about our friend, The St. Landry Bell. Takes a lot of brass to be heard in Baton Rouge but they've heard him even there. Our bell is the only one in the world with its own blog, Facebook, and Twitter page. Not bad for a 98 year old. 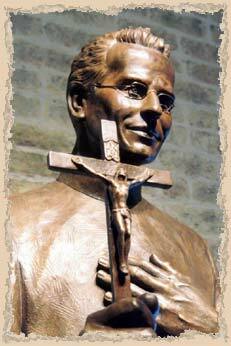 It's the Tenth Anniversary of the Beatification of Blessed Francis X. Seelos, C.Ss.R. The mass will be Sunday, April 25, 2010 at 1 PM at the Nation Seelos Shrine/St. Mary's Assumption Church. The Church is located at 919 Josephine Street, New Orleans Louisiana - that is in the Lower Garden District/Irish Channel. One on One Intercessory Prayer in back of church & in shrine, starting at 11:45 AM -- venerate his relic as you and your loved ones enter. You can visit the Shrine/Museum and see the new Seelos Welcome Center Monday thru Fridays from 9 AM to 3 PM, Saturdays 10 AM to 3:30 PM. The Gift Shop is at 919 Josephine Street, on the first floor. It will be open before and after the mass. Sign up for the monthly newsletter there. Bob and Penny Lord will be visiting in our Diocese over the next week. Many of you have seen them on EWTN in series that cover their travels to various shrines and holy places around the world. During the homily, Monsignor Romero referenced questions 127 thru 129 of the Compendium in the section "Jesus Christ descended into hell; on the third day He rose again from the dead." Along with the essential sign of the empty tomb, the Resurrection of Jesus is witnessed to by the women who first encountered Christ and proclaimed him to the apostles. Jesus then “appeared to Cephas (Peter) and then to the Twelve. Following that he appeared to more than five hundred of the brethren at one time” (1 Corinthians 15:5-6) and to others as well. The apostles could not have invented the story of the resurrection since it seemed impossible to them. As a matter of fact, Jesus himself upbraided them for their unbelief. While being an historical event, verifiable and attested by signs and testimonies, the Resurrection, insofar as it is the entrance of Christ's humanity into the glory of God, transcends and surpasses history as a mystery of faith. For this reason the risen Christ did not manifest himself to the world but to his disciples, making them his witnesses to the people. The current week's homily is available on a link on the front page of the website next to the link for the current week's bulletin. On the page with the prior bulletins, the corresponding homily will be sitting side by side with its bulletin. We started on the anniversary of the start of the Catholic Church, Pentecost Sunday. This week, the Third Sunday of Easter, is our sixty second podcast to be posted. This week, the homily is given by Monsignor J. Robert Romero. So, take a listen and let us know what you think. Click here to download the Third Sunday of Easter homily from St. Landry Catholic Church, Opelousas, Louisiana. The apostles openly give witness to the power of Jesus' name. "I will praise you Lord, for you have rescued me." John declares the glory of Jesus, The Lamb of God. The risen Christ welcomes his own at the seashore. Jesus, feed us so that we can feed and serve others. In today’s Gospel, we witness one of the Lord’s post-Resurrection appearances. Jesus prepares breakfast for his disciples. Peter, who had betrayed Jesus a few days earlier, is invited to eat the fish Jesus has prepared. Just as Peter had denied Jesus three times, so today he professes his love for Jesus three times. Let us see in this simple seaside meal the expression of reconciliation that today’s Eucharist offers to all who believe. Jesus asks Peter three times if Peter loves Jesus. What one thing can you do this week to show Jesus you love Him? Jesus asked Peter three times to "feed my sheep". Whom are you being called to help in your life right now? Christ continues to feed us as his disciples, even after his death and resurrection. How does the Eucharist feed your faith? "Lord, you know everything, you know that I love you." After appearing to the disciples two times in a room behind locked doors in Jerusalem, Jesus reveals Himself a third time to seven of His disciples who are fishing at the northwest end of the Sea of Tiberias (Galilee). The scene is a reminder of His first call to them to become fishers of men. After preparing and sharing a breakfast of fish with them, Jesus asks Simon Peter three times, “Do you love me?” Peter, who had denied Jesus three times, finally says, “Lord you know everything, you know that I love you”. Peter reveals his great faith in Jesus. Only God knows everything and only God could know what was in Peter’s heart. When we encounter Jesus He asks us, “Do you love me?” Is our faith in Jesus such that we have no doubt that He is God and that He knows what is in our heart? Many people will receive the Sacraments of First Eucharist and Confirmation in April and May. Celebrate their progression in faith formation. Pray for their continued development throughout life. Serve as a good role model and mentor to encourage further personal and spiritual growth. Stewards mentor others toward a closer relationship with God. 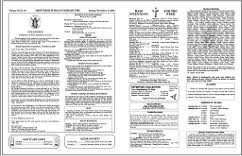 The bulletin for the week of April 18, 2010 has been posted. Click here to see it. La Vita Monastica (The Monastic Life) is my photographic study of the cloistered community of Benedictine nuns at the Abbey of Regina Laudis in Bethlehem, Connecticut. The roots of The Abbey of Regina Laudis, founded in 1947, have their origin in the ancient Abbey of Notre Dame de Jouarre, which was founded in the 7th century and is located northeast of Paris. This personal project started as a single assignment. Many of the images here are being shown for the first time. Council members are coming in May. The pastoral council member term is a 3-year commitment with a monthly meeting held on the first Monday of each month. The purpose of the church pastoral council is to advise our pastor on issues and events within the church parish. This year we have two positions to fill. Parishioners interested in becoming a candidate are to submit your name and a brief paragraph of your call to church parish involvement to the Church Office. The deadline for submitting candidates is Thursday. April 15, 2010. For more information, contact Yvonne L Normand, Church Trustee, and Election Chair at 337-308-3474. I think these things are essential [in the daily life of a priest]: the Eucharist, the Office of Readings, prayer and a conversation every day, even a brief one, with the Lord on his words, which I must proclaim. And never lose either your friendship with priests, listening to the voice of the living Church, or the availability to the people entrusted to me, because from these very people, with their suffering, their faith experiences, their doubts and difficulties, we too can learn, seek and find God, find our Lord Jesus Christ. Pope Benedict XVI’s visit to the Roman Major Seminary on February 17, 2007. Many thanks to all who helped care for the Church’s liturgical environment during Lent and the Easter Triduum. I thank all who worked on the Easter decorations. A great job!! I also thank all the altar servers, lectors, extra ordinary ministers of communion, ushers, sacristans, and music ministers for their good work. The many demands of the Easter Triduum Liturgy were surpassed with trouble-free teamwork. In addition, acknowledgement is due to all who participated in the washing of the feet on Holy Thursday. These are Shelby Boudreaux, Alice Cormier, Lloyd Cormier, Howard Fournier, Mark Fuselier, Frances Hargroder, Audra LeJeune, Lee LeJeune, Gloria Miller, Madisonne Ned, Tyler Smith, and Beau Stelly. Vatican Information Services has launched a blog. I would like to think they are following St. Landry Catholic Church's example ... ha ha! 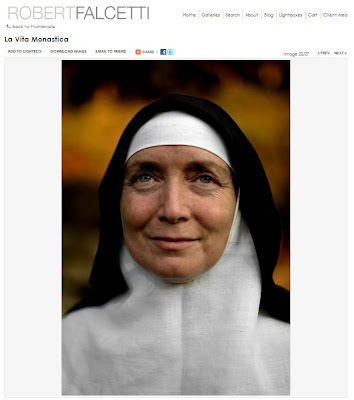 To see the latest on the blog of the Vatican's news site, click below. 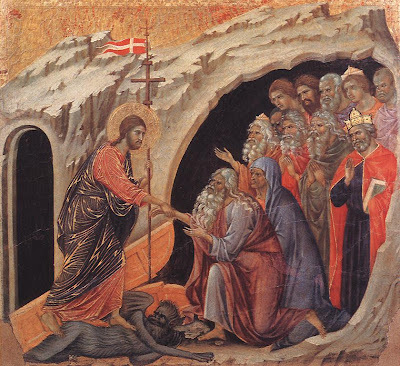 Monsignor J. Robert Romero included a section of an Ancient Homily for Holy Saturday in the weekly bulletin as an example of "Greeting in the Lord". Jesus greets Adam after the crucifixion. The painting above portrays the event. Christ in a robe trimmed with gold stands on a vanquished demon as he reaches out to help Adam up. Eve sits beside him. You can see the crushed doors of hell below as well. David appears with a crown. Other ancient forefathers surround them. Below is the full homily as it read in the Liturgy of the Hours for Holy Saturday. The greeting is in the third paragraph. who is God, and Adam's son. At 3 PM this afternoon at Our Lady Queen of Angels in Opelousas, Louisiana, there will be a benediction as well as the praying of the Divine Mercy Chaplet. 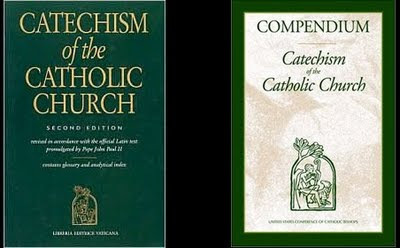 During the homily, Monsignor Romero referenced paragraph 445 in the Catechism of the Catholic Church under the topic of "The Only Son of God". 445 After his Resurrection, Jesus' divine sonship becomes manifest in the power of his glorified humanity. He was "designated Son of God in power according to the Spirit of holiness by his Resurrection from the dead".57 The apostles can confess: "We have beheld his glory, glory as of the only Son from the Father, full of grace and truth." The current week's homily is available on a link on the front page of the website next to the link for the current week's bulletin. On the page with the prior bulletins, the corresponding homily will be sitting side by side with its bulletin. We started on the anniversary of the start of the Catholic Church, Pentecost Sunday. This week, Divine Mercy Sunday, is our sixty first podcast to be posted. This week, the homily is given by Monsignor J. Robert Romero. So, take a listen and let us know what you think. 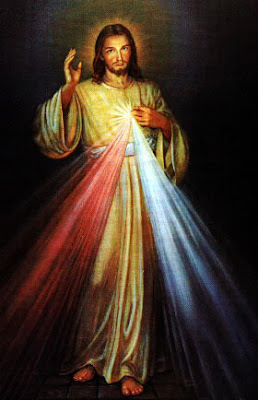 Click here to download the Divine Mercy Sunday homily from St. Landry Catholic Church, Opelousas, Louisiana. The bulletin for the week of April 11, 2010 has been posted. Click here to see it. Peter's faith in Jesus enables him to work signs and wonders. "Give thanks to the Lord for he is good, his love is everlasting." He is the first and the last, the one who lives. How blessed are those who have not seen but have believed. Today’s scriptures invite us to gather around the risen Christ, whose words echo across the millennia to each person in this holy place: “Peace be with you.” This blessing is at the heart of the message of Easter. As the scriptures are proclaimed, let us pray for a continued outpouring of peace on a world grown weary by war and violence. Jesus appeared to the disciples even though they were afraid and locked in the closed room. How can you show Jesus to another person this week by the way you act? Thomas didn't believe because he hadn't seen Jesus with his own eyes. How hard is it for you to believe in God without being able to see God? How do you see God in the words and actions of others? Jesus said: "Blessed are those who have not seen and yet believe." Give one example of how you will show your belief in Jesus this week -- how you are being sent forth. "Blessed are those who have not seen and believe." John tells us that the disciples who abandoned Jesus when He was arrested and taken to the cross [John was one of them] were locked in a room a week after they had seen him risen from the dead and had appeared to them in that same room. Jesus had good reason to be disappointed with them, but He says to them, “Peace be with you!” He knew it was difficult for them to believe even though they had seen. And He knew how difficult it would be for us who had not seen to believe. That is why, at our Baptism, our parents, or we ourselves if we are old enough, promise to make our faith constantly grow stronger in our hearts and to bring that faith unstained into heaven. We renewed our Baptismal Promises on Easter Sunday. What have we done to make our faith grow stronger in our hearts? What are we doing? What will we do in the future? Are we being good stewards of our faith? Stewardship starts with the personal experience of the Risen Christ in our midst and in our hearts. It is a vocation to discipleship. We have so much to consider as we progress through Easter and Spring. Learn about Our Lord’s special grants of mercy and forgiveness to sinners on Divine Mercy Sunday (April 11th). Citizen stewardship is reflected on tax day (April 15thth). We celebrate and value God’s Creation in special ways on Earth Day (April 22nd). Throughout the month, let us strive to further develop our personal relationship with the Risen Christ and give witness to our discipleship through our stewardship expressions of daily living. Al Soileau will speak to the Imperial St. Landry Genealogical and Historical Society this Saturday, April 10th. He will discuss history and interesting facts about St. Landry Catholic Church. Society meetings continue to be held at 10:00 am on the second Saturday of each month (except December.) Doctor's Hospital is now referred to as the SOUTH CAMPUS of OGH (Opelousas General Hospital) and the Society continues to meet in the first floor Conference Room. Coffee and other refreshments will be served beginning at 9:30 am before each meeting. The public is always welcome. From Rome Reports' YouTube channel, here's a video of the best images from Holy Week at the Vatican with the Holy Father. Today, for those who pray the Liturgy of the Hours, the Te Deum is prayed. This hymn will be prayed every day during the octave of Easter as well as the Sundays of Easter. It's name, Te Deum, comes from the opening line, "Te Deum Laudamus --- You, God, we praise!" Historically, it was said that the hymn was written and sung by St. Ambrose and St. Augustine on the night of St. Augustine's baptism around the year 387 A.D. More recent scholarship says it was written by Nicetas of Remesiana (modern day Romania) 100 years later. During the Jubilee Year of the Church in 2000, Pope John Paul II declared this hymn the Jubilee Hymn. you did not spurn the Virgin's womb. Deacon John Miller lights the candles of altar servers from the Easter Candle. 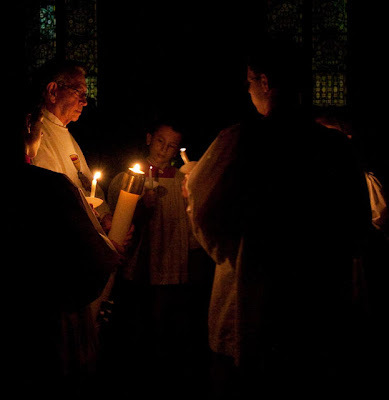 We've got photos up from the Easter Vigil Mass. It's the full mass along with the lighting of the Easter Candle and confirmation. We also have photographs of the practice before the mass here: http://www.stlandrycatholicchurch.org/gallery2/main.php/v/20100403EasterVigilPractice/. Our altar servers worked very hard during the Easter Triduum as well as throughout the year and we want to thank them. Our bell started ringing again during the Gloria at Easter Vigil and we now celebrate the Easter season. Two links to music from our choir at St. Landry Catholic Church, headed up by Curt Miller. Click here for Pange Lingua from Holy Thursday Mass during the Reposition of the Blessed Sacrament, April 1, 2010. Click here for Ye Sons and Daughters from Easter Vigil Mass during communion, April 3, 2010. Lyrics of "Ye Sons and Daughters"
today the grave bath lost its sting. Alleluia! the Marys went their Lord to seek. Alleluia! 'Your Lord is gone to Galilee.' Alleluia! and said: 'Peace be unto you here!' Alleluia! 'and doubt not, but believe in me.' Alleluia! 'Thou art my Lord and God,' he cried. Alleluia! in laud, and jubilee, and praise. Alleluia! in glory to the King of Light. Alleluia! Take a look at the Daily World newspaper, page 2A at the top left. There's a photo from our Holy Thursday mass featuring Monsignor J. Robert Romero and Mr. Howard Fournier! Easter is here --- and we celebrate the Resurrection of Our Lord. The Resurrection Window at our church is a powerful image. One of the Roman soldiers has been knocked down. Christ stands on an opened sepulchre with a staff bearing his standard. Below him is a casted off cloak and the crown of thorns. He's clothed now in fine clothes and raises his right hand in a blessing. A flower next to the sepulchre blooms. Today is also the 1st anniversary of our new look website and our blog. It's been a wonderful year, sharing all of the things going on in and around our parish as well as all things Catholic around the world. We've received kind comments and questions from around the world, have had some of our artwork featured in diocesan magazines as far as Spain, and have had some of our information featured in other blogs on the internet. We've started a presence on Twitter and Facebook, set up a YouTube channel, and have started a new presence for the St. Landry Bell on those social sites as well. Thanks to everyone for all of the positive feedback and we hope to be an even better resource into the future. The current week's homily is available on a link on the front page of the website next to the link for the current week's bulletin. On the page with the prior bulletins, the corresponding homily will be sitting side by side with its bulletin. We started on the anniversary of the start of the Catholic Church, Pentecost Sunday. This week, Easter Vigil, is our fifty eighth podcast to be posted. This week, the homily is given by Monsignor J. Robert Romero. So, take a listen and let us know what you think. Click here to download The Easter Vigil homily from St. Landry Catholic Church, Opelousas, Louisiana. An ancient Jewish legend from the apocryphal book “The life of Adam and Eve” recounts that, in his final illness, Adam sent his son Seth together with Eve into the region of Paradise to fetch the oil of mercy, so that he could be anointed with it and healed. The two of them went in search of the tree of life, and after much praying and weeping on their part, the Archangel Michael appeared to them, and told them they would not obtain the oil of the tree of mercy and that Adam would have to die. Subsequently, Christian readers added a word of consolation to the Archangel’s message, to the effect that after 5,500 years the loving King, Christ, would come, the Son of God who would anoint all those who believe in him with the oil of his mercy. “The oil of mercy from eternity to eternity will be given to those who are reborn of water and the Holy Spirit. Then the Son of God, Christ, abounding in love, will descend into the depths of the earth and will lead your father into Paradise, to the tree of mercy.” This legend lays bare the whole of humanity’s anguish at the destiny of illness, pain and death that has been imposed upon us. Man’s resistance to death becomes evident: somewhere – people have constantly thought – there must be some cure for death. Sooner or later it should be possible to find the remedy not only for this or that illness, but for our ultimate destiny – for death itself. Surely the medicine of immortality must exist. Today too, the search for a source of healing continues. Modern medical science strives, if not exactly to exclude death, at least to eliminate as many as possible of its causes, to postpone it further and further, to prolong life more and more. But let us reflect for a moment: what would it really be like if we were to succeed, perhaps not in excluding death totally, but in postponing it indefinitely, in reaching an age of several hundred years? Would that be a good thing? Humanity would become extraordinarily old, there would be no more room for youth. Capacity for innovation would die, and endless life would be no paradise, if anything a condemnation. The true cure for death must be different. It cannot lead simply to an indefinite prolongation of this current life. It would have to transform our lives from within. It would need to create a new life within us, truly fit for eternity: it would need to transform us in such a way as not to come to an end with death, but only then to begin in fullness. What is new and exciting in the Christian message, in the Gospel of Jesus Christ, was and is that we are told: yes indeed, this cure for death, this true medicine of immortality, does exist. It has been found. It is within our reach. In baptism, this medicine is given to us. A new life begins in us, a life that matures in faith and is not extinguished by the death of the old life, but is only then fully revealed. expressed and made visible in a way that demands commitment for the rest of our lives. There is first of all the rite of renunciation and the promises. In the early Church, the one to be baptized turned towards the west, the symbol of darkness, sunset, death and hence the dominion of sin. The one to be baptized turned in that direction and pronounced a threefold “no”: to the devil, to his pomp and to sin. The strange word “pomp”, that is to say the devil’s glamour, referred to the splendour of the ancient cult of the gods and of the ancient theatre, in which it was considered entertaining to watch people being torn limb from limb by wild beasts. What was being renounced was a type of culture that ensnared man in the adoration of power, in the world of greed, in lies, in cruelty. It was an act of liberation from the imposition of a form of life that was presented as pleasure and yet hastened the destruction of all that was best in man. This renunciation – albeit in less dramatic form – remains an essential part of baptism today. We remove the “old garments”, which we cannot wear in God’s presence. Or better put: we begin to remove them. This renunciation is actually a promise in which we hold out our hand to Christ, so that he may guide us and reclothe us. What these “garments” are that we take off, what the promise is that we make, becomes clear when we see in the fifth chapter of the Letter to the Galatians what Paul calls “works of the flesh” – a term that refers precisely to the old garments that we remove. Paul designates them thus: “fornication, impurity, licentiousness, idolatry, sorcery, enmity, strife, jealousy, anger, selfishness, dissension, party spirit, envy, drunkenness, carousing and the like” (Gal 5:19ff.). These are the garments that we remove: the garments of death. essential content of baptism has remained the same. It is no mere cleansing, still less is it a somewhat complicated initiation into a new association. It is death and resurrection, rebirth to new life. The bulletin for the week of April 04, 2010 has been posted. Click here to see it. 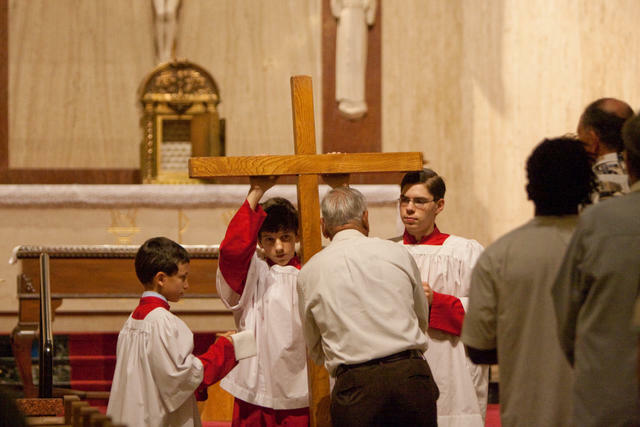 A parishioner venerates the cross held by altar servers at St Landry Catholic Church during Good Friday Services. We've got photos up from the Good Friday Service. It's the full service along with the veneration of the cross. We also have photographs of the practice before the service here: http://www.stlandrycatholicchurch.org/gallery2/main.php/v/20100402GoodFridayPractice/. Our altar servers work very hard during the Easter Triduum as well as throughout the year and we want to thank them. 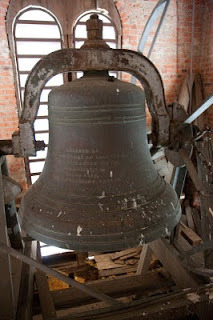 You'll notice there is no activity on the Twitter, Blog, and Facebook accounts for the St. Landry Bell. The bell rang during the Gloria of Holy Thursday Mass and won't be heard again until the Gloria of the Easter Vigil. Our church is quiet and is awaiting the Risen Lord. Please join us tonight at 8 PM for The Easter Vigil Mass. Or come Easter Day for our two masses, one at 8 AM and the other at 10 AM - no 5 PM mass. St. Landry Catholic Church, 1020 North Main Street, Opelousas, Louisiana.